Raising chickens is a great experience for the whole family. One of the primary requirements is providing housing that is comfortable for your backyard flock. Young chicks can be raised in a variety of structures, but the area should be warm, dry and ventilated, but not drafty. Also make sure it is easy to clean. Small numbers of chicks can be warmed adequately with heat lamps placed about 20 inches above the litter surface. Bigger groups of birds in a large room, such as a shed or a garage, should have a supplemental heat source such as a brooder stove. Several days in advance, thoroughly clean and disinfect the brooder house and any equipment the chicks will use. Doing this in advance will allow everything to dry completely. Dampness is a mortal enemy to chicks, resulting in chilling and encouraging disease such as coccidiosis (parasite infection). When the premises are dry, place 4 to 6 inches of dry litter material (wood shavings or a commercial litter) on the floor. Dip the beaks of several chicks into the water to help them locate it. These chicks will teach the rest. Day 1: Use clean egg flats, shallow pans or simple squares of paper with small piles of feed on them. Day 2: Add proper feeders to the pens. A few days later: Remove the messy papers, pans or egg flats once chicks have learned to eat from the feeders. Wet litter around waterers should be removed as often as possible. Dampness encourages disease and parasite transmission. The drier the premises, the healthier and happier the chicks. At about 4 weeks of age, ducks and geese will appreciate a swimming area, but you will need to keep the wet litter cleaned up. In winter months, you may need to purchase a water heater to prevent water from freezing. Feeders and waterers can be moved outward from the heat source, expanding their area of activity and helping keep the feeders and waterers clean. It is important to select a complete feed that gives your chicks all the nutrition they need to grow into healthy hens. Once they’ve reached maturity,a high-quality complete layer feed will help to maximize egg production and quality. If they are broiler chicks, choose a feed designed to support their more rapid growth. Layer chicks will reach egg-laying age at about 18 to 20 weeks; broiler chicks will reach market weight at 8 to 10 weeks. You may also consider occasional supplements to their diet, such as table scraps, scratch grains, oyster shell and grit. However, supplemental feeds should make up no more than 10 percent of a hen’s diet. 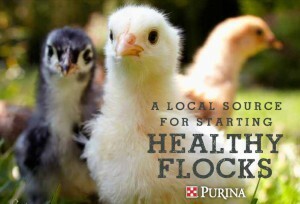 Purina offers a complete line of poultry feeds appropriate for each bird in your flock. A list of Purina products can be found here. A thermometer should be placed at the chicks’ level to accurately gauge temperature. For turkey chicks, the comfort zone should be 100º F.
Use a brooder guard (a plastic, cardboard or wire barrier) for a few days to encircle the brooding area so that the chicks don’t wander too far from the warmth. Once chicks have learned where the heat is, remove or expand the guard. This will allow the chicks to escape the heat if necessary. Getting overheated can be as dangerous as getting chilled. Chicks that huddle under the lamp are too cold. Chicks that sprawl along the brooder guard are too hot. Chicks happily milling around all portions of the brooder area are comfortable. The temperature can be gradually reduced by 5º F per week to a minimum of 55º F.
Even after your chicks have grown into hens, keep a standard old-fashioned 40-watt incandescent light bulb handy; or, if you’re using the new energy-efficient bulbs, a 28-watt halogen, 10-watt compact fluorescent, or 8-watt LED bulb, to maintain the artificial light necessary for egg laying to continue through the winter months. This entry was posted on Monday, January 28th, 2019 at 2:33 pm	and is filed under News & Updates. You can follow any responses to this entry through the RSS 2.0 feed. Both comments and pings are currently closed.